and this taffy centerpiece is amazing! Love the giant cupcake with the giant paper liner. It's her party and she can cry if see wants to. This party was hosted by Jamiee Rose, not Party Wishes, and you can check out more of her pictures here. How cute. Love the caption of that last photo. I hope the mommy does scrapbooking and can use that. This is so adorable... I love it! My kinda party! Wee one would LOVE a giant cupcake cake!!! I love the taffy centerpiece...how cool. so cute i hope you don't mind - i posted the pic of those great taffy skewers and gave you full credit on my blog........don't worry too much I don't have a very big following.....I love your blog and all your wonderful ideas. How sweet!! We have a photo of our son on his first birthday, next to his cake, screaming bloody murder, too! Our daughter, on her first b.day, just wanted to poke her finger in the cake. I loved both of the days and will always remember them....just like this mom you featured, will recall with much fondness, the first birthday party of her little princess. That taffy arrangement is so neat! Love it! my head is spinning...only 9 more months till my daughter's 1st birthday...how will i ever pick a theme, there are too many great possibilities!!! Love all your party ideas! I must ask where did you get the large diaper pin in the nursery? It is too cute! 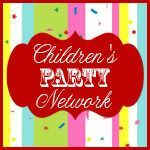 Donna - Thank you for featuring pics I took at my sister's party on your blog. I'm glad you found them inspiring. However, next time can you please credit my sister and me? Thanks. where can u order the taffy skewers?